Batman & Robin is a 1997 superhero film directed by Joel Schumacher. Based on the DC Comics character Batman, the film is a sequel to Batman Forever (1995), with George Clooney replacing Val Kilmer as Batman. Batman & Robin also stars Arnold Schwarzenegger, Uma Thurman, Chris O'Donnell, and Alicia Silverstone. The film tells the story of Batman and Robin struggling to keep their relationship together. At the same time, they have to stop Mr. Freeze, Poison Ivy, and Bane from covering Gotham City with ice and vegetation. 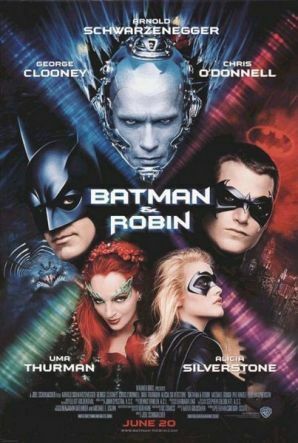 Development for Batman & Robin started immediately after Batman Forever, and Warner Bros. commissioned the film for an adamant June 1997 release. Principal photography began in September 1996 and finished in January 1997, two weeks ahead of the shooting schedule. Batman & Robin was released on June 20, 1997, and was critically panned. The film was a modest financial success, but observers criticized the film for its toyetic and campy approach, as well as possible homosexual innuendo added by Schumacher. Batman & Robin received numerous nominations at the Razzie Awards and frequently appears on lists of the worst superhero films of all time. After Warner Bros. canceled the unproduced Batman Triumphant, the film series was eventually rebooted with Batman Begins (2005).